Gary Ling Business Strategist - Gary Ling, Digital Producer, Data Monetiser, Political Savant, Information Economist, Solution Seller, Business Strategist. Gary can add value to your organisation with his experience of working on Business Strategy projects. Essence? The definition of business strategy is "a long term plan of action designed to achieve a particular goal or set of goals or objectives." Whereas, marketing strategy is "a process that can allow an organisation to concentrate its limited resources on the greatest opportunities to increase sales and achieve a sustainable competitive advantage." If the latter is not a better definition of business strategy I don't know what is. Surely, increasing sales and achieving a sustainable competitive advantage is why businesses exist. That's why marketers make the best business strategists! Education? As Sandhurst/MBA educated Leader, I have the academic training and practical experience to understand that even the best laid strategic plans can go astray (and sometimes pretty quickly). Nonetheless, without a strategy a business is rudderless. Luckily, every organisation I have worked in has taken this discipline seriously. Some, like GE, over strategised if that's possible with training in 6 Sigma, whilst others, like the Global Business Intelligence Network (GBIN) had a strategic plan that changed organically in light of changes to the market environment and resources available. Experience? As Digital Director with the Global Business Intelligence Network, I was responsible for building out digital properties globally. I have experience of negotiating contracts in China and India and developing critical supply chain partnerships in those countries. As contracted Operations Director working on the COOL-ER eReader, I help devise a guerrilla marketing strategy against eReader giants Apple and Amazon. Event? Unquestionably the most intense business strategy adventure that I have ever had was the launch of the COOL-ER in 2009. My client, Interead Limited, was lead by an innovative entrepreneur who practiced Ballsy Thinking, was receptive to new ideas and Kept It Simple Stupid (KISS). All the characteristics of a successful strategy for launch. From inception to launch the COOL-ER eReader took seven months which involved pulling people and operations together on three continents. The COOL-ER website was the most global, most heavily trafficed website at launch I have ever seen from a standing start (helped by a global PR campaign run out of New York). 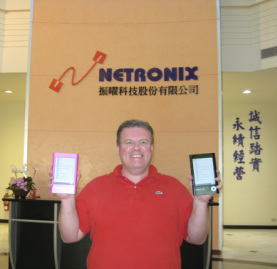 In this photo I am shown picking up the first COOL-ER eReaders as they rolled off the production line of our Taiwanese manufacturers.